Dr Lutz Nielen (aixACCT Systems GmbH) attended the 10th International Meeting `Electroceramics for End Users X - PIEZO 2019‘ held on January 27th - 30th, 2019, in Špindlerův Mlýn, the Czech Republic. 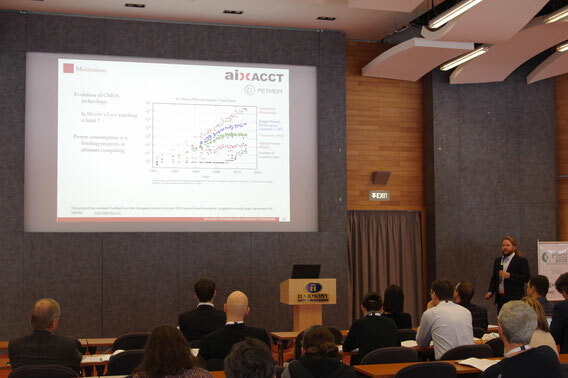 He presented an invited talk on the metrology work that aixACCT Systems is doing as part of the PETMEM research project. Prof. Markys Cain (Electrosciences Ltd) attended MRS Fall 2018, in Boston, USA November 25-30, 2018, and presented an update of the PETMEM research project as an invited talk in the ‘New Materials and Applications of Piezoelectric, Pyroelectric and Ferroelectric Materials’ session. The consortium’s progress was applauded by many attending the talk and offers of collaboration were forwarded by leading research labs and world leading companies, interested in our ‘beyond CMOS’ approach to low power, high speed electronics technology. The PETMEM Consortium partners with Poet in the City and Aurora Orchestra to engage the public about the possibilities of the PETMEM technology. Through a collaboration between poet Frances Leviston, composer Martin Suckling and the scientists working on the PETMEM technology, new works have been created to construct new pathways for the wider public to explore and understand this new technology. The artists have responded by drawing on the memory of two great forbearers in poetry and music, Emily Dickinson and Schubert. Influenced by the voltage Dickinson achieves in her densely packed poems, Leviston’s new set of poems wonders how Dickinson might have responded to the PETMEM technology; the poems draw upon a range of references from female scientists involved in the project to the raw materials used in the technology and the eloquent metaphors scientists have used to explain this novel device. In a similar vein, Suckling explores the idea of music under pressure with a new chamber work in which fragments of Schubert’s great String Quintet are echoed, compressed, distorted and crystallized. The artists will be launching their new work with celebrated scientist Stuart Parkin in a live BBC Radio 3 broadcast at the Wellcome Collection London as part of a Memory Weekender. Please tune in! Commissioned by Bio Nano Consulting Ltd for the dissemination of PETMEM (Piezoelectronic Transduction Memory Device), a European Commission-funded project which brings together universities, research institutions and companies to explore low-voltage memory technologies. 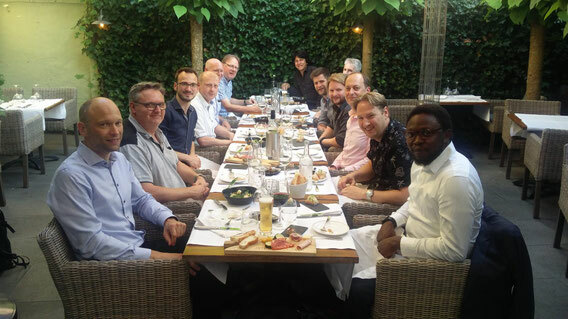 The PETMEM consortium (left) was at the Solmates in Enschede, Netherlands on the 6th and 7th of June 2018. The extensive discussions that ensued about the completed and upcoming deliverables and milestones were very fruitful. This was followed by a tour of the Solmates labs which allowed the consortium to see the diverse technical capabilities available at this world-class facility. We look forward to the next 6 months of the project, we are excited and filled with great expectations. At Max Planck Institute, Dresden, Germany (15-16th June 2017), the steering committee conducted a strategic review of the target application areas. We concluded that the best chance for early adoption of PETMEM will be through RF switching applications while the memory application (especially with VLSI) will be a longer-term target. 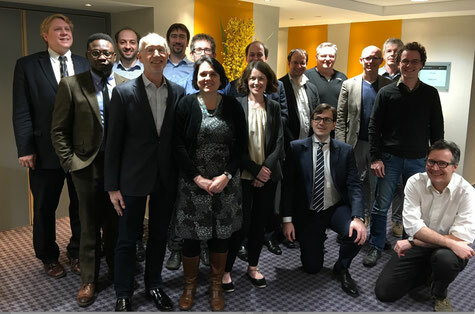 By recognizing Europe’s strength in the RF sector, the consortium is convinced that the production of a RF switch demonstrator will generate a lot of interest for industrial collaboration (especially within the EU). Already, we have established contact with Prof Peter Aaen of Surrey University-5G centre who has accepted to perform initial microwave testing of the PETMEM RF switch demonstrators. 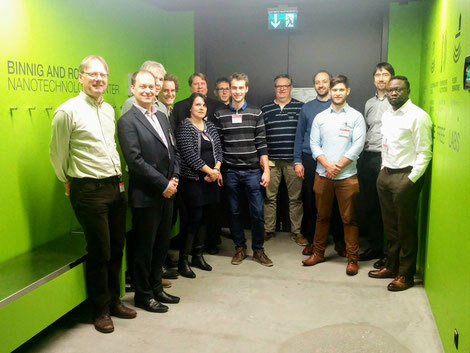 IBM Zurich hosted the PETMEM consortium (left) on the 8th and 9th of December 2016. The consortium has achieved all of the intermediate objectives and milestones foreseen in year 1. We discussed the planned month-12 review meeting in Brussels. This was followed by a tour of the Binnig and Rohrer Nanotechnology Center Switzerland. On the 15th of December 2016, the project review took place in Brussels with representation from all the partners. The overall assessment was positive with specific recommendations for improved future exploitation of the technology. We are excited and filled with great expectations the next 6 months of the project. The PETMEM team (above) met at the Pullman Hotel in Central London on 27-28 January 2016. After extensive discussion, the partners agreed on the critical dimensions of the PETMEM device that is to be built and materials to be used. The Industrial Advisory Board (IAB) meeting of the PETMEM project will be hosted in London by the Institute of Materials, Minerals and Mining (IOM3) on the 15th of May 2017. The IAB include external contributors from industry and universities, who will be advising the "Consortium" in relation to the PETMEM technology and how it aligns with the expectations and needs of the industry. We are looking forward to some exciting and insightful discussions. Prof. Markys Cain [Electrosciences Ltd, UK] attended the 2016 International Workshop on Acoustic Transducer Materials & Devices, 9-12 May 2016, held at Pennsylvania State University, PA, USA. 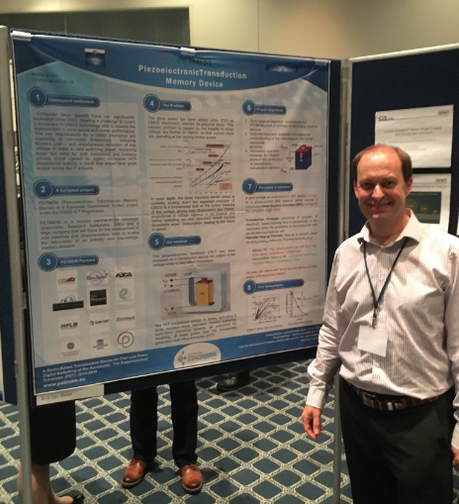 The EU H2020 Project ‘PETMEM’ was provided with a 3 minute pitch and poster slot under the single crystals materials and devices session. 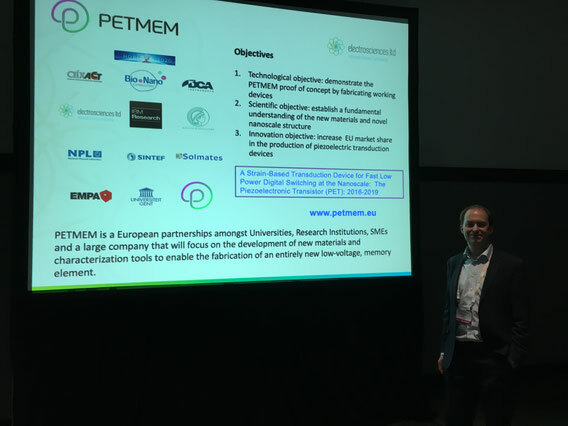 Prof Cain outlined the PETMEM project’s key aims and objectives which culminated in a great deal of interest from the audience and subsequent poster session. The workshop provided a forum for reports on, and discussions of, the state-of-the-art in materials and devices to generate, detect, and suppress sound. Naturally, this then included the concepts behind the Piezoelectric transistor technology central to the PETMEM project. Prof Cain (right) also met and discussed the project with International steering committee member, Prof Susan Trolier-McKinstry of Penn State University, and later contributed to the IEEE standardisation committee on single crystal materials. The drive towards higher quality piezoelectric thin films and further integration into MEMS/NEMS electronic devices was noted as well as the continuing route taken to develop higher temperature single crystal piezoelectric materials. Jacob B. J. Chapman, Oliver T. Gindele, Carlo Vecchini, Paul Thompson, Mark Stewart, Markys G. Cain, Dorothy M. Duffy, and Anna V. Kimmel, “Low temperature ferroelectric behaviour in morphotropic Pb (Zr1−xTix)O3”, Journal of the American Ceramic Society, vol. 5, pp. 1–9, Sep. 2017. Hisao Nakamura, Ivan Rungger, Stefano Sanvito, Nobuki Inoue, Junji Tominaga and Yoshihiro Asai, “Resistive switching mechanism of GeTe–Sb2Te3 interfacial phase change memory and topological properties of embedded two-dimensional states”, Nanoscale 9, 9386 (2017). Xiaoliang Zhong, Ivan Rungger, Peter Zapol and Olle Heinonen, “Ab initio modeling of transport and thermodynamic stability for hafnia memristive devices”, J Comput Electron (2017). December 2017, Volume 16, Issue 4, pp 1066–1076. Donata Passarello, Simone G. Altendorf, Jaewoo Jeong, Charles Rettner, Noel Arellano, Teya Topuria, Mahesh G. Samant, and Stuart S. P. Parkin “Evidence for Ionic Liquid Gate-Induced Metallization of Vanadium Dioxide Bars over Micron Length Scales”, Nano Letters 17 (5), 2796-2801. 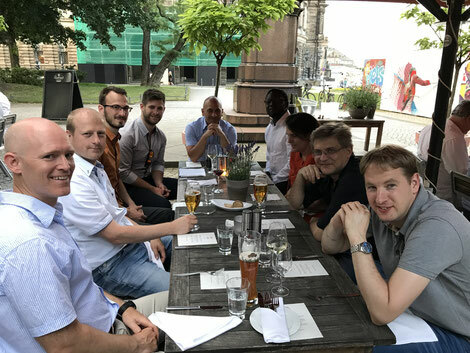 M. A. ElGhazali, P. G. Naumov, H. Mirhosseini, V. Süß, L. Müchler, W. Schnelle, C. Felser, and S. A. Medvedev, Phys. Rev. B 96, 060509(R) – Published 30 August 2017. P. G. Naumov, K. Filsinger, S. I. Shylin, O. I. Barkalov, V. Ksenofontov, Y. Qi, T. Palasyuk, W. Schnelle, S. A. Medvedev, M. Greenblatt, and C. Felser, Phys. Rev. B 96, 064109 – Published 16 August 2017. J. B. J. Chapman, O. T. Gindele, C. Vecchini, P. Thompson, M. Stewart, M. G. Cain, D. M. Duffy, and A. V. Kimmel, J. Am. Ceram. Soc., vol. 5, pp. 1–9, Sep. 2017. 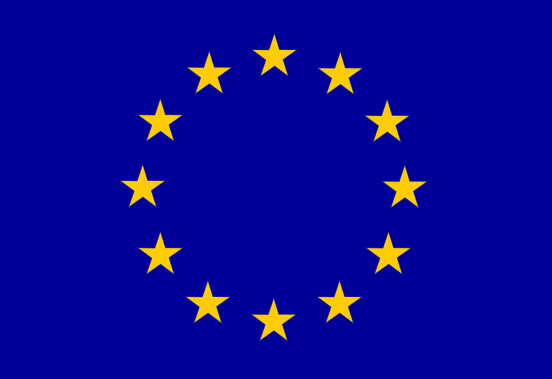 On the 27th of September 2018, the PETMEM project was reviewed by the European Commission in Brussels. The expert reviewers concluded that PETMEM has achieved most of its objectives for the period under review. Key milestones planned for the period have been achieved. As at June 2018, the consortium has made a lot of progress which includes the deposition of epitaxial PMN-PT on STO and epitaxial TiN (by Sintef and Solmates) as well as the deposition of optimized Heusler compound and SmS with RE (by Max Planck Institute and University of Gent) all on 150 mm silicon wafers for generations 2 and 3 devices. Our business analysis suggests that the best chance for early adoption of PETMEM will be through RF switching applications while the memory application (especially with VLSI) will be a longer-term target. 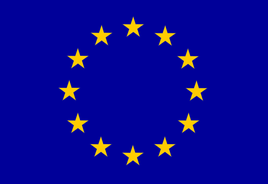 By recognizing Europe’s strength in the RF sector, we are convinced that the production of a RF switch demonstrator will generate a lot of interest for industrial collaboration (especially within the EU). We will work with Prof Peter Aaen of Surrey University-5G centre to perform initial microwave testing of the PETMEM RF switch demonstrators. BNC and Electrosciences are collaborating with Poet-in-the-city and Aurora Orchestra to deliver a PETMEM Public Engagement event in London on the 15th of October 2017 and later in January 2018. The key objectives involves the use the arts to create an engaging conversation about the complex science involved in the PETMEM technology and to engage the general public with key ethical questions relating to increasingly efficient energy consumption and the many likely futures for memory storage. aixACCT Systems has installed a setup for reliability testing that allows up to 64 samples to be tested in parallel. The system consists of a micro-controller, a switch-matrix and software for data acquisition. Reliability test on PE samples from SINTEF is planned for Q1 of 2017. We are working to develop new materials and characterization tools to enable the fabrication of an entirely new low-voltage, memory element. 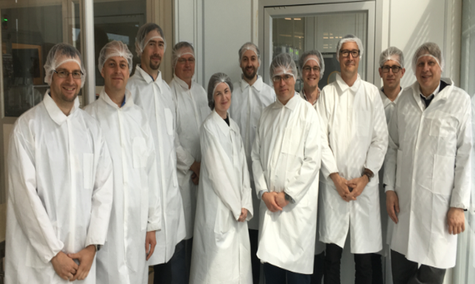 The PETMEM consortium was at the SINTEF MiNaLab in Oslo, Norway on the 1st and 2nd of June 2016.